The latest confidential techniques in spreading the message of Objectivism are apparently too double-plus secret to be revealed to the general public, and must be privately circulated by invite-only blog. Such is the new Intellectual Activism, started by a member of Diana Hsieh's private Obloggers list. 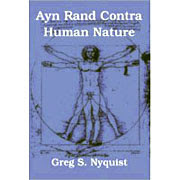 Given Rand's novels were bestsellers, that the ARI have airlifted almost a million free copies of her books into U.S. schools over the past 5 years, that that same Institute has a funded program for infiltrating Objectivist scholars into academia, and also that Rand received immensely more PR over her lifetime than any philosopher before or since, it is hard to see what the inevitable suggestions of database construction, newsletters, coffee klatches, cake-stalls etc is going to achieve. Not that there haven't been recent attempts to divert the eternal Objectivist blab-fest in an "activist" direction, like this extremely exciting "activism" site here. The actual activism component at RoR seems also pretty secret, brilliantly disguised as yet another blab-fest. At any rate, one is forced to conclude that the "Intellectual Activism" cone of silence conceals from prying eyes not a Galtian premise-correcting ray gun, but rather a lame list of DIY Avon marketing tips. The secrecy thing conjures up romantic images of heroic young Ragnars banding together and plotting to infiltrate, expose and sabotage the inner workings of anti-freedom organizations -- everything from environmentalist groups and news media to government agencies and political parties -- and to orchestrate mysterious, headline-grabbing pranks, mind-bogglingly clever protests and Mission Impossible-like capers. It brings to mind sharp young Slugs and Friscos fearlessly looking for every opportunity to publicly debate those who oppose Objectivism. Unfortunately the reality will probably consist mostly of smug letters to newspapers, more online preaching to the choir, and avoiding at all costs open debate with anyone who has potent criticisms of any of Rand's ideas. I just hope that Diana Hsieh and friends realize that secrecy only works when you are trying to exploit a difference in knowledge. For example; If you're a software company, you would prefer if you were the only people that could write code that could do 'X', So you keep the source code for app 'X' secret. In the case of spreading Objectivism. If Objectivism is worth believing, and Objectivists promote it correctly, there shouldn't be differences in knowledge to exploit. Another thing that perhaps Diana hasn't considered yet is that arguments cannot really be kept secret and still be effective. If you're trying to convince a person, you're going to tell them your argument anyway, and there ends your secret. If the argument is true no amount of publicity will be able to refute it. If the argument is false, keeping it secret is not going to preserve it.